Pinterest is the foundation of 99% of my conversations. And the birth of this latest and greatest idea. 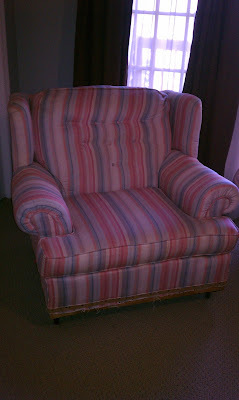 I have this fluffy, comfy, and slightly hideous old chair that belonged to my parents since... oh, I don't know, the 80's? I've seen pictures of it in a brown pattern that might have been a velvet of sorts. Then my mom had it recovered in the late 80's or early 90's, I would guess. 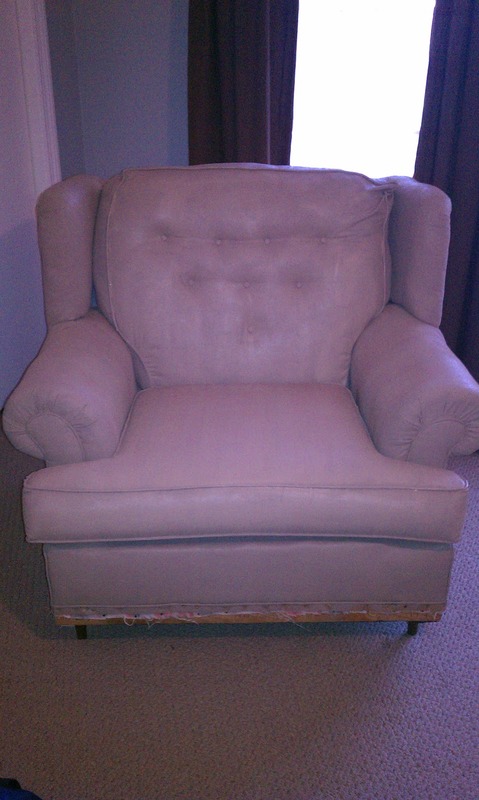 When I moved into an apartment in college, we used this chair and couch in our living room. 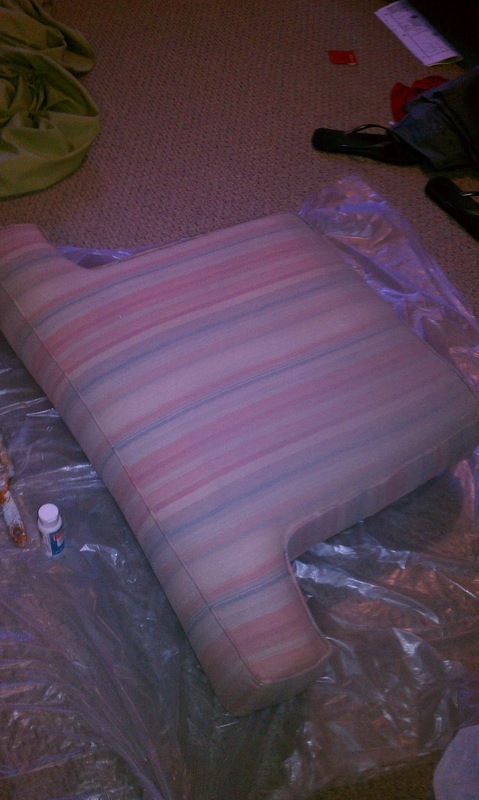 I pieced together some green slipcovers and it was functional, at best. Since then it has been a mix-matched fixture in my bedroom at my current house. The green isn't so bad, but does not fit any of the other colors in my room. Here begins the birth of the "new" chair. I saw this pin on pinterest on how to paint a fabric chair. That's right, fabric. I was doubtful, to say the least. Here is a picture of the monstrosity before. First, I partially read the tutorial. Next, I started throwing the "ingredients" in a solo cup and slapping it on. Then, I read the rest of the blog and realized I had forgotten a step. Oops. 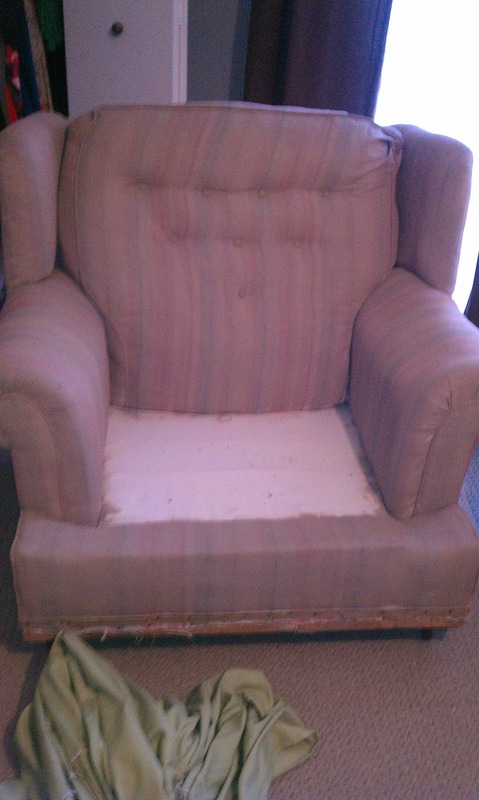 But it didn't mess it up too badly, and I don't plan on really lounging in this chair, so a messed up chair wouldn't rock my world too much. I mixed the fabric medium and the paint with some water, painted it on, and then let it dry.